These were taken at the San Diego Zoo. I'm not a birder, but I think this is an Oriole. I almost used them for Watery Wednesday, but thought they were perfect for SOOC. No tweaking, just cropping. Oh, the photos are marvelous! It is so obvious he is enjoying his bath. lol cute! Love them. Yay I linked first this week. Great captures, Jan. 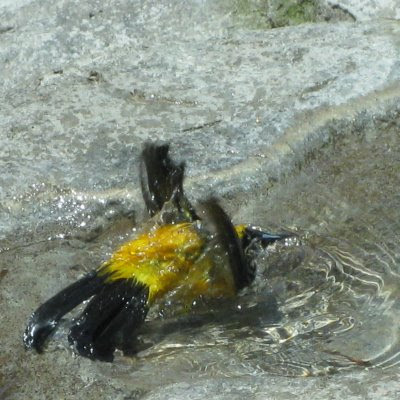 I think bathing birds are so much fun to watch! Great shots. Looks like the brown bird is a little envious of all the water fun that other bird is having! Rub a dub dub! What great captures!!! Super pictures Jan. 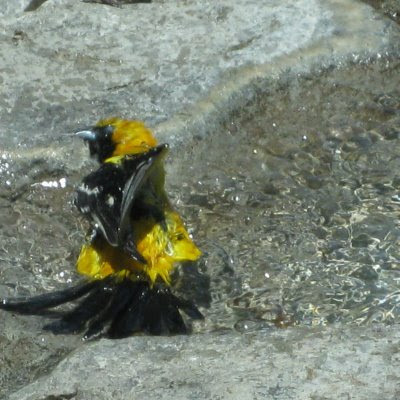 I always love to watch birds bathe. They seem to love it so. It looks like the bird is swimming! Good luck with the new meme....if I ever get a SOOC shot good enough I'll post one! 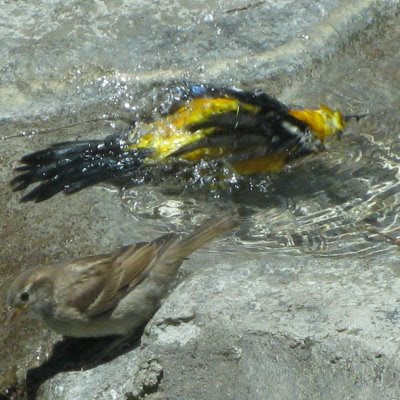 Wonderful photos have birds enjoying a play and dip in the water! Incredible! it looks like they're having so much fun cooling down in the water! That is pretty neat. It looks like he is enjoying himself. Jan, great shots, I love the bathing beauty. Those are very beautiful - is the yellow bird OK - it looks too wet? Must be very hot there!